In the sacred land of Bharat, forbearance is the greatest wealth. The sweetest feeling is the feeling of motherhood. Today we have bid farewell to the great principle that one's honor is greater than one's life. There are women who lead good lives, earn grace and progress towards God. But today, many of them have also given up the above mentioned principle. For a cultured woman, three things are most essential- Kattu (dress habits), Bottu (the dot on the forehead) and Juttu (proper hair). The ladies have given up such sacred habits and they wear pants and shirts like the men do! They give up putting the dot on the forehead and keep their hair short like boys! This is a total contradiction to the way of life taught by the Bharatiya culture which always grants great honor and bliss. Boys too will have to lead a respectable and honorable life, working hard, getting good marks and most importantly- making parents and society happy. 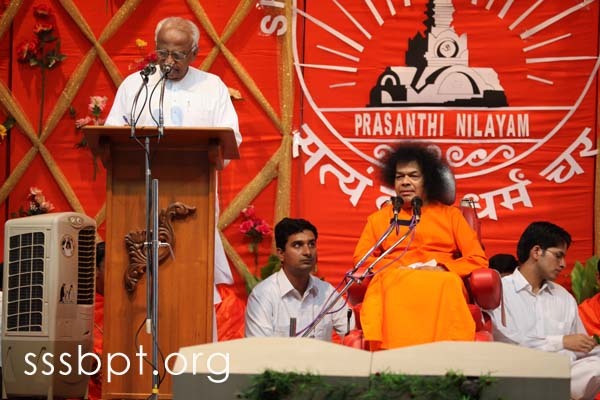 Special Darshan, Prasadam and Message..with photos. People today have forgotten the important principles of Daiva Preeti (love for God), Paapa Bheethi (fear of sin) and Sangha Neethi (morality in society). You may forget God, but God will never forget you, for God resides within you. To realize and understand God is difficult. You imagine God has a form. Painters draw images of Krishna and Rama, and you conclude that it is the form of the Lord. God has come in human form. But realize that the body is only a bag - a bag which contains the mind, intellect, ego and the senses. But they are not related to the body. Only the five elements constitute the body. If the inner contents of the body are gone, the body is of no use and it is burnt to ashes (in a pyre). So don't give undue importance to the body. Krishna, Rama, etc. are all mere symbols of divinity. Find out who is really Krishna. Don't worship the body. That will lead to fickleness of the mind. For that, all of you try to concentrate. When you persist in concentration, it becomes contemplation. Finally, the form dissolves and you forget yourself - that is Samadhi, meditation. We imagine that God will then manifest in a form. It is the Atmic principle that prompts you thus. What actually manifests is not any form, but the Truth. Then depending on your imagination or vision, you see either Krishna or Vishnu. Give up the form and find the Truth. All these are gimmicks of the mind. You have to dissolve the mind because it keeps prompting you to proceed on these paths. Focus on the Atma which has neither name nor form. Everything has arisen out of Truth and to Truth it will return. Truth is there everywhere - in the birds, animals and even the tiny insects. That is why, whomsoever you meet, bow in salutation to them. That is not an obeisance to the body, but to the Atmic principle within. Even when you see beggars, salute to the Atma in them. God is one in all. See, if there are a thousand pots of water, all of them reflect the Sun equally. Does that mean that there are a thousand suns? Bodies are like pots. Desires are like water in the pot. (When they exist we see so many suns!). In fact, everything is reaction, reflection and resound. Whenever we love anyone, we love ourselves. Do not think that you are doing something for God. Whatever you do, you are doing it for yourselves alone. God is present everywhere like the current that makes the fans move, bulbs light up and the mikes produce a sound. Switch off the current and everything goes off. If you forget divinity, you forget everything. Love God and conquer the demon of bad qualities. Only a person of such good character can develop the society. Love for God will automatically lead to morality in society. If there is no morality, there is no community. There is only one caste - that of humanity. The sections like Brahmins, Kshatriyas, Vaishyas and Shudras are created by us and are not given by God. The one thing that God has given to all is Prema (Love). When you don't have Love in your hearts you will hate. Love all, Serve all. If you uphold these principles, you will definitely prosper. Help others, especially the poor and the needy. Not only people, every animal is a reflection of God. Cheemalo Brahmalo sang the saint Thyagaraja. It means that God is there in everything - from the ant to the cosmos. So do not get angry or hate anything. If you lead such a life, you will know yourself. We always say, "I, I". That is the ego. To realize the real "I", cut the ego (body consciousness). Then you get the Cross (the holy Cross) too. You become God. The sense of mine and thine lead to duality. The Upanishads will never accept duality. It is for the sake of leading a life and doing your duties that you have been given a body. Duty is God. When you have a wife, treat her as a wife but remember that the same Atmic principle abounds in her. Even during the marraige of Rama with Sita, it was so. (At this point Swami sang a poem that depicted the festive mood at Mithila for the Divine marriage.) Sita represents the Atma. It was the marriage of Atma and Rama. So many people assembled for the marriage to see Rama and Atma. In this hall too, all of you have assembled to have the darshan of Swami. After the marriage, Vishwamitra saw Rama wherever he went. Swami had once written a song, Sathya Dharmamu Shanthi Premalatho, meaning that one must lead one’s life according to Sathya, Dharma, Shanthi and Prema. Once there is Sathya and Dharma, peace and Love will come. In any situation, do not utter lies. Love cannot stay where there is untruth. The essence of the teachings of all the Upanishads is that all are ultimately One. Beggars surround a rich man asking him for money, food and house. You go to God and ask the same. Don't beg. You will be provided everything. God is within you. Society gets spoilt by such "beggars". Do not become a beggar. Everything - the water, the air, the food -are getting polluted and spoilt. The only solution to remove pollution is to develop a pure mind! When is the mind pure? When it is doubtless and has steady faith. What is the use of all the degrees that you get? Ph. D holders themselves are so full of sin! Everything is done to beg for money. If you go to a temple, a bus or even for a cup of coffee, people want money. MAN is the true wealth and not money. Safeguard humaneness, then you get everything. Lead a life of humility without arrogance and pride. Man has emerged from the heart, not the physical one but the spiritual heart. That is like the pure breeze that pervades everything. Be helpful to all whatever be the action you do. Help ever, hurt never. Respect your parents even if they are unable to give you food. The mother faces great difficulties to bring you up, making sacrifices. Never distance your parents from yourselves. All your education must be directed to satisfy your parents and then that will give you also satisfaction. All your friends are not true ones. They stay with you as long as you have money in the pocket. Do not love another for the material possessions. Love must be a mental one - not a material one. Sai Baba discourse on Makara Sankranthi, 14, Jan 2009 "...Today, people are able to achieve great progress in secular and scientific fields, but they are unable to march forward in the field of spirituality. One has to progress in spirituality more than in other fields...."